Designer Roger Sweet claims to be the chief creator of He-Man and MOTU, although this is not officially acknowledged by Mattel. Please see He-Man Character Guide. As with many toy franchises transferred to several different media there are a number of story differences between the various versions of Masters of the Universe. Complicating matters further several made implicit attempts to change details to realign with other versions, with the result that some internal discontinuities arrive. All the toys came with minicomics that sought to tell stories involving the characters. In the earliest comics, He-Man is a wandering barbarian on the world of Eternia, which is dealing with the aftermath of a Great War that has devastated the civilisations that once reigned. He-Man is given special powers and weapons by The Sorceress of Castle Grayskull and sets out to defend the secrets of Castle Grayskull from Skeletor. He-Man is supported by allies such as the Eternian Man-At-Arms called Duncan and Teela. A key task is to prevent Skeletor from linking the two halves of the "Power Sword" which will allow him to gain access to the castle. The second series of minicomics establish the existence of the kingdom of Eternia, ruled over by King Randor and Queen Marlena. The third series developed the concepts further by giving He-Man the secret identity of Prince Adam, the son of Randor and Marlena. 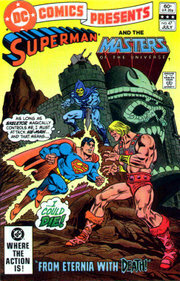 The original Masters DC Comics take place in this Eternia, though there are a few contradictions stemming from the early alterations to the storyline. In one of the stories Superman is transported to Eternia where he teams up with He-Man, and he later returns for a second adventure. The middle years of the minicomics adopted the same scenario as the animated series, and even adapted some stories for the comic form. In later years the comics would handle the character and back story of Hordak differently from the cartoon. The final minicomics were released after the animated series had finished and feature many characters and equipment never seen on screen. He-Man and the Masters of the Universe, produced by Filmation, made its television debut in 1983. Eternia is ruled by King Randor and Queen Marlena. Their son is Prince Adam, a cowardly blond muscleman dressed in a Cote d'Azur chemise. However, Prince Adam possesses a magic sword, and when he holds it aloft and says the magic words "By the Power of Grayskull! I have the Power!" he is transformed into He-Man, the most powerful man in the universe. He-Man is a brave blond muscleman in a baldric and loincloth.